You may have received a letter recently telling you of the new guidelines schools have to follow with the school lunch. Here is a breakdown of what you can expect. Schools are now required to serve at least 1/2 cup of fruit and 3/4 cup of veggies each per meal, and there are weekly requirements for vegetable options that are green, red or orange, & starchy. The old standards called for just 1/2 to 3/4 cup of fruits and veggies combined (and French fries were considered equal to vegetables like broccoli!). Low-fat dairy Whole and two percent plain milk will be replaced by one percent or nonfat. Chocolate milk is lowfat also. Before this year, they weren’t required at all. Now, half of all grains must be whole, and by 2014, all grains served at school much be whole grain rich. Trans fats were unregulated till now. All elementary lunches can not be more than 650 calories and 700 for middle school lunches and zero grams of trans fat per serving. Elementary school lunches must contain fewer than 640 milligrams and middle school lunches contain fewer than 710 milligrams. Sodium will be gradually lowered further through 2023. For example the guideline the company that runs the school lunches at my children’s schools says they are to provide more deeply colored, nutrient dense,fiber rich fruits and vegetable such as sweet potatoes, spinach, broccoli,and beans. Provide more whole grain food such as brown rice and whole wheat. Encourage lean proteins including vegetarian and plant based. Reduce unhealthy fats, sodium and sugar. 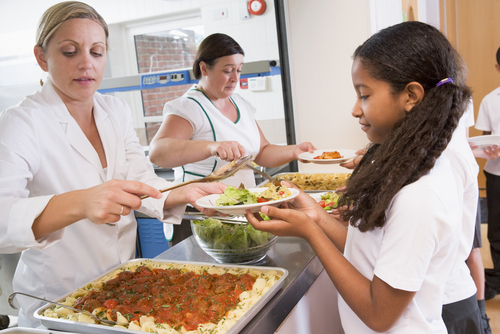 Your child’s school may contract their lunch program out and offer additional thinks like hormone free milk, poultry. and meat without antibiotics and locally grown produce. These are not required but sometimes offered. You may want to ask your child’s school or the company it is contracted out to.